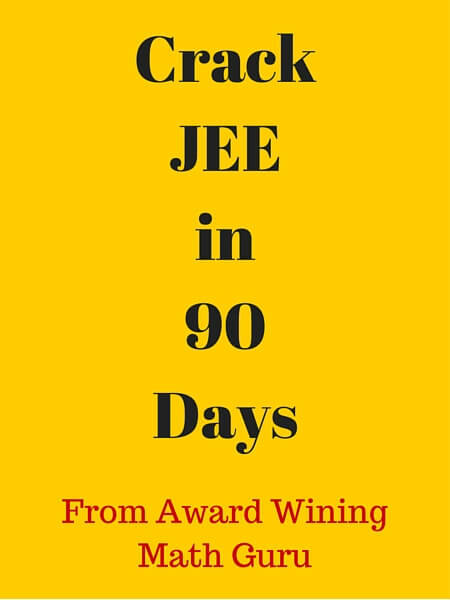 The other day, a student asked me this question: Can I crack IIT JEE in 90 days? My answer was: Yes off-course you can do, but not by reading these type of books. In last couple of years, from digital medium to testing platforms, the way students are preparing for entrance examinations like IIT JEE is changing. Online coaching is slowly becoming the preferred choice for students (due to location and language constraints). Among all these advancements, there are still some myths and misconceptions about IIT JEE Preparation. Without wasting any time, let’s talk about them one by one. Myth #1: I bought this brand new book “Crack JEE in 60 days”. It’s my shortcut to IIT. The genuine advice is, whenever there is less time remaining, you have to put more effort into your studies to practice enough questions for good JEE preparation. Stay away from the type of books which promises you to Crack JEE in X number of days. They are published for only one reason – to earn some quick money via catchy titles. Even if you are super intelligent and confident of clearing JEE with only two months preparation, the trend of getting into IITs is not in favor of you. I would say only one thing – IIT JEE preparation takes time. Myth #2: Buying video lectures of IITians is the success mantra for IIT. These days, we see lots of companies selling video lectures as a promise to clear IIT JEE, promoted as the video lectures recorded by IITians themselves. You bought these video lectures. Great! It’s just like a broadcasting, isn’t it? What if you want to ask questions after watching the videos? Are the sellers of these IIT JEE videos available for you to resolve your queries. I doubt that. Remember, you only paid for the videos, not for clearing your doubts! Video lectures can never replace a two way live interaction between a teacher and a student for IIT (or any competitive examination) preparation. Yes they can help you in understanding concepts, but focusing completely on just video lectures to clear IIT is a gamble, even if they are prepared by top IITians. Myth #3: I am going to Kota, IIT goal is achieved. Every year, Kota produce successful results in IIT JEE. But the interesting thing is the ratio of students clearing IIT JEE to the total number of students competing in Kota. The number of students who clear IIT JEE from Kota in a given year, are not even 1% of the total students in Kota who prepare for the exam. The competition is tough. Don’t be in a fallacy that going to Kota and by taking coaching from a bigger institute will assure you a seat in IIT. Your hard work and commitment level is more important. Myth #4: I have enrolled for 5 JEE testing platforms, I will be the best! There has been a lot of surge in testing platforms for examinations in last couple of years. Providing JEE sample/mock tests digitally to students is appreciating effort. The problem is, sometimes students thinks it as a shortcut to clear IIT JEE, which is not correct. The understanding of concepts is equally important. Don’t take test engines as the only preparation of IIT JEE that you require during last few months before the exam. You also have to keep an eye on the quality of questions in these tests. The quality matters more than the quantity. It’s true in case of JEE preparation. Myth #5: I will buy the best books for JEE and going to rock the exam! Books have always been our most essential requirement for any examination. In addition to NCERT, there are some very good reference books available for IIT JEE preparation. Learning from book is a type of passive learning. Yes, you try to understand topics and practice questions from the book, but the approach is one dimensional. Do you have someone who can tell you that – this might not be the best method for solving this question, or you are taking too much time in solving this specific problem. Do books take care of your preparation level? Do they identify your weak areas? Do they give you additional tips and tricks to solve a particular type of question? Unfortunately, the answer to all these questions is NO. A classroom (physical or online) with a teacher provides you the benefits that you don’t get in books. The end of the day, the thing that will help you in clearing JEE is a combination of the classes you attend, your teachers, and the hard work you put in by yourself. Testing platforms, videos lectures and good books can improve your chances to clear IIT JEE, but only if they are considered after the basic preparation strategy. Disclaimer: The image used in this post is just my imagination of these type of books. It has no relation with any of the already existing book in the market.